Ian: Many thanks for taking the time to answer some questions…. 1) When I write a review I always like to give some background on the author, but all I could find was the stock blurb.. you are the veritable ghost man (writer) of the roman world… can you add some meat to the bones of who is Ian Ross? 2) What made you choose Roman Historical Fiction and why so late in the history of the Empire? I’ve always been drawn to history, and the Romans in particular hold a special appeal. It’s that combination of the familiar and the completely alien I suppose – they resembled us in so many ways, but their society and beliefs were often brutally different. Periods of revolutionary upheaval and change interest me – change creates conflict, and conflict creates stories. The later Roman period was a time when the empire was changing, Christianity was becoming a force in the world and the old certainties were breaking down. There was a real sense that civilisation was in jeopardy, and perhaps the drama seems all the more intense set against that dark background. There was plenty of action too: near-constant wars on all frontiers, tangled alliances and intrigues, enormous battles and towering personalities. For perhaps the first time, ordinary men could rise to positions of great, and perilous, power. To throw a protagonist into that world, and to use his experiences as a sort of prism to show the wider picture, seemed to hold enormous potential. 3) I have to admit to ascribing some influences/ comparisons (in my view) for your book. “the depth of detail and narrative of Ben Kane, the action and pace of SJA Turney and a main character that has the depth and personality of Simon Scarrows Macro “ What if any influences do you think you have in writing this series (I really believe each person will see their own version of influences in any writing). Being compared to some of the biggest writers in the field is very flattering – thanks! Of course, I’ve read most of the Roman fiction that’s come out in the last five or six years, and enjoyed it greatly. But I think with War at the Edge of the World I was consciously trying to reach back to things I’d read a few years before; probably there’s more direct influence from books like Steven Pressfield’s Gates of Fire, or Wallace Breem’s Eagle in the Snow – I love their very gutsy muscular prose style, and the convincing detailing of the era. Rosemary Sutcliff too – Eagle of the Ninth, naturally, but more especially Frontier Wolf, and The Flowers of Adonis, which was one of her books for adult readers. She had a superb way of summoning a sense of place, a feel for the setting and the landscape. I suppose that might relate to my background in painting – I tend to think very visually, and I enjoy being able to see places through description. 4) Centurion Aurelius Castus, what was the influence behind him as a main character, the bluff, soldier rather than the man at the centre of power (eg a book following Constantine)? Is he based on anyone you know? One of the first aspects of the story I came up with was the character of the protagonist, Castus – or Knucklehead, as I called him at first (the nickname stuck, even if it is anachronistic!). I found I could picture him very clearly right from the beginning. Essentially he’s the opposite of me in many ways – very physical, instinctive, inclined towards action rather than reflection. He’s also very big and brutal-looking, and can’t read or write, which leads people to underestimate him, often to their cost. I’ve never been drawn to superheroes or very larger-than-life characters, but Castus has a shrewd intelligence, a genuine sense of honour and a deep vein of compassion, and I hope it’s these qualities that make him heroic, besides leading him steadily into conflict with the far more twisted morals of the world around him. 5) Where will we go next? As a reader im tempted ito wish for two separate directions, I want to be with Centurion Aurelius Castus, I want to find out what happened to Cunomagla. I also want to follow the rise of Constantine, there is so much story there, so much intrigue for Centurion Aurelius Castus to become embroiled in. Castus will always remain at the heart of the story; the successive books in the series follow his rise through the hierarchy of the late Roman army, which parallels the rise of Constantine to supreme power. So the two of them are interlinked; the further he rises, the closer Castus gets to the emperor himself and the inner circles of imperial rule, and the more he gets to see of the realities of power, and the often inglorious ways that empires are maintained. Castus is a traditionalist, loyal to the old gods of Rome, so Constantine’s adoption of Christianity is going to be one of many challenges he has to face, with both his beliefs and his loyalties tested to breaking point. But there’s plenty of adventure along the way too: it’s possible that at some point Castus might find himself in north Britain again, and we’ll see more of Cunomagla, but he’s got a long road to take before he gets there! 6) If you had the choice of any other Genre to write in, what would it be and why? 7) What / who do you read for fun? Besides the extensive research for the Castus books, which I genuinely enjoy – perhaps I enjoy it a bit too much at times – most of my reading lately has been other historical fiction. I’ve just finished Christian Cameron’s brilliant The Ill-Made Knight; his Tyrant novels are superb, and this one was just as impressive. The way he conjures the sense of an entirely convincing past world is both daunting and inspiring. Robert Low does the same, especially in his ‘Kingdom’ series, which was very powerful. There seems to be a lot of good medieval stuff around at the moment actually – next on my list is Toby Clements’ Kingmaker: Winter Pilgrims… Probably my favourite contemporary writer, although not one I’d like to try and emulate, is Hilary Mantel: her Thomas Cromwell novels have revolutionised the way people think about historical fiction. There’s a visceral intensity about some of her writing that takes my breath away. 8) Who are the writers that have influenced you most, from making you want to be a writer, through to style? I’d say my earliest influences were the classic adventure writers of the 19th century, particularly Joseph Conrad and Robert Louis Stevenson. Graham Greene too, from a later era; his stories have a real sense of moral complexity and peril about them. It took me quite a long time, I think, to realise that what I enjoyed most in fiction was powerful and compelling storytelling, combined with strong graphic description and depth of character. Writing War at the Edge of the World, I also found myself recalling some of the fantasy/sf novels I’d enjoyed in my teens; I recently reread Gene Wolfe’s Book of the New Sun and Soldier in the Mist, and I was amazed at how much of it had remained lodged in some corner of my mind. Undoubtedly the things you read at an early age often make the greatest impression. 9) If you could invite any four people from throughout history or fictional writing to dinner, whom would it be and why? Inviting interesting historical figures to dinner might be risky; many of them probably wouldn’t get on, and you may not make it through to dessert! In purely practical terms, I’d love to quiz the Roman soldier and writer Ammianus Marcellinus: the first thirteen books of his history of the later empire, including the bits covering the reign of Constantine, are lost, and he could fill me in on the no-doubt scurrilous details. I’d rather invite the emperor Maxentius to dinner than his great rival Constantine: it would be interesting to get the loser’s side of the story for a change, and I could find out exactly what he thought he was doing at the battle of Milvian Bridge… Zenobia of Palmyra would no doubt enliven any party, and Gore Vidal would, I’m sure, have a host of pithy anecdotes to cover any awkward lapses in the conversation. 10) Finally, the bit most authors would shy away from. You have a soap box and the publisher has asked you to stand outside Kings cross and sell your books to the passers buy… what would your pitch be to make the public buy this book/ series? I would probably need the help of the late Don laFontaine, of the gravelly movie-trailer voice, to do justice to my soap box. 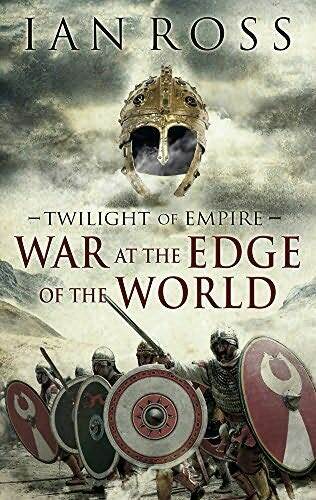 I’ve never been fond of pitches myself, but if pushed I might end up with something like Conflict, adventure and dangerous intrigue on the far northern frontier of a declining Roman empire…. this is one not to miss, and for those of you who collect signed books… get this now, they will go very fast, Ian Ross is a name to watch.